Right now, running from today until January 2nd, StrangeMusicInc.net is having a holiday sale. Most items are available for a discounted price with a lot of them on for less than half the price at 60% off! 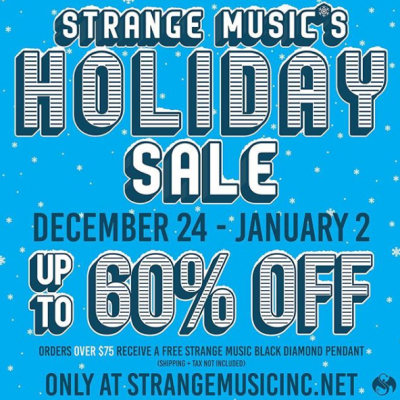 Spend $75 or more and get a free Strange Music Black Diamond Pendant. I’m grabbing that Strange Music Christmas sweater for next year. Hell yeah. Hit up StrangeMusicInc.net and take advantages of those deals, Technicians.